Brightening up cramped home spaces can be a struggle, but stopping by a nursery or gardening store will help. So go ahead, bring nature home — add some leafy accents to your personal space. This shop on Mirza Ghalib Street has its own nursery unit in South 24 Parganas and they cater to international clients in Bangladesh, Nepal, Bhutan and Dubai. The folks here are known to be experts in all kinds of gardens — rooftop, terrace, rock gardens, and more. They provide a wide array of plants from the popular cycus, and oxtail palm, to kentia, areca, plumeria, as well as flowering plants like dahlia, hibiscus, and all kinds of roses. They also stock avenue trees, foliage plants, bonsai, etc. 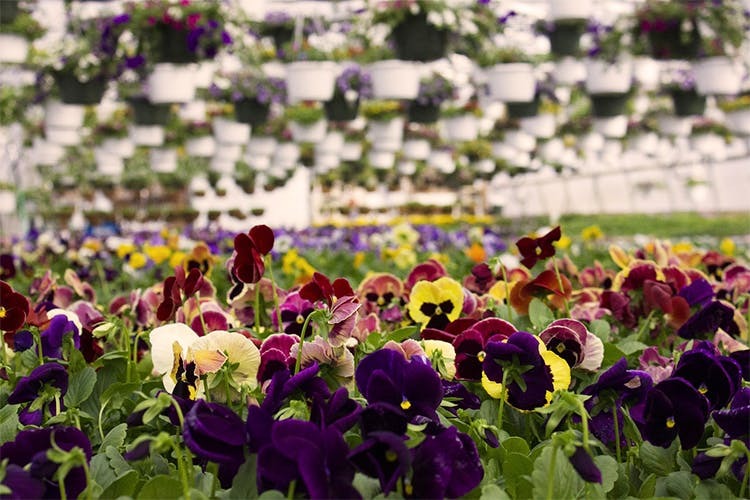 Formerly known as GeeBee Enterprise, they have been in the horticulture business since 1982. They specialise in creating gardens, tree transplantation, rockery and topiary making. Some of their clients include Taj Bengal and Hindustan Uni Lever Limited. You can check out their website here and follow them on Facebook here. A one-stop destination for all your gardening needs, this nursery in Sikherpur, Rajarhat also specialises in landscaping, consulting, gardening, beautification and office décor. You can call on 098303 21126 to find out more. You can follow their Facebook page here. The oldest institution of its kind in India, this society not only places a crucial role in horticultural development and environmental restoration, but they also provide rare and useful plants, eco-friendly gardening material, insecticides and pesticides, organic soil, etc. You can become a member of the society by clicking here. They organize several flower shows every year. Keep a watch on their website for upcoming events here. Follow them on Facebook here. You can take short courses on gardening as well. For details, click here. Or you could just visit their vast space in Alipore for some instant inspiration! Apart from a range of bonsai, cacti, succulents, orchids and seasonal flowers, you will a good stock of pesticides and fertilisers at a reasonable price at this place in Salt Lake. With an exclusive collection of 2,500 varieties of indoor and outdoor plants, Green Mall is famous for its wide array of exotic plants. You can find grass carpet, ground-cover, hedges, bush, screening plants, vertical garden plants, hanging plants, creepers, flowering plants, fruit plants, trees, palms, cycads, bonsai, spices, herbs and medicinal plants — you name it, it’s there. To assist with your gardening, they also provide gardening tool and gardening books. Located beside Lindsay Hotel in Lindsay Street, this place deals in outdoor and indoor plants, bonsais, seeds and medicinal plants. If you’re looking for ornamental plants, medicinal plants, climbers, saplings, fruit plants or even palm trees and avenue trees, you can now get it all under one roof at this place.